We got the lowdown from the Kilkenny senior ahead of tomorrow’s All-Ireland club final. 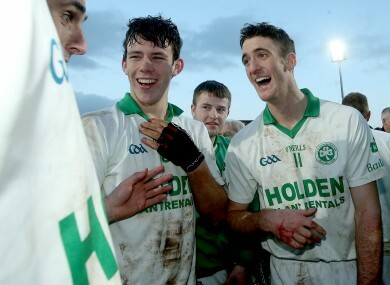 Colin Fennelly was all smiles with his Ballyhale teammates after last year's Leinster club final win. 2014 KILKENNY ALL-IRELAND winner Colin Fennelly lines out with his Ballyhale Shamrocks teammates in the AIB All-Ireland senior club hurling final tomorrow. It’s a huge occasion as they bid to see off Kilmallock and bag the club’s sixth All-Ireland crown. There’s a feel-good factor about the Kilkenny club but we wanted Fennelly to dish the dirt and tell us what he really thinks of his teammates. 6. Biggest leader and motivator? 8. Biggest messer in the dressing-room? Email “Colin Fennelly dishes the dirt on his Ballyhale Shamrocks hurling teammates”. Feedback on “Colin Fennelly dishes the dirt on his Ballyhale Shamrocks hurling teammates”.